The LT vz. 38 is a Czechoslovakian tier 3 light tank. The LT vz. 38 leads to the ST vz. 39. - Tier III match: The LT vz. 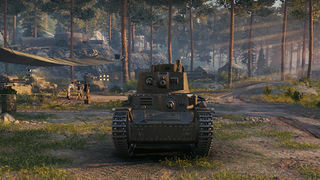 38 can assume a variety of medium tank tactics such as active flanking, supporting/suppressive fire and some spotting. - Tier IV match: The LT vz. 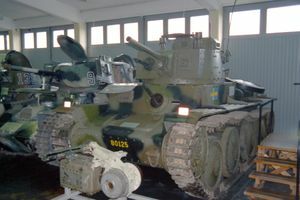 38 can be effectively used for supporting fire or cautious spotting as a second line tank on the flanks of the maps most used by lights and mediums and to provide itself as an interceptor to enemy light tanks who breach the front lines for reconnaissance purposes or attacking allied spg's. 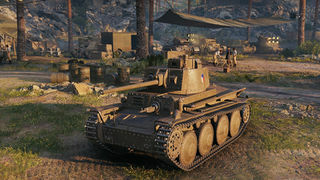 Attacking heavy armoured medium or heavy tanks (e.g Matilda, B1) at close range up to 200m should be avoided unless their hp is significantly reduced, and the situation is critical. - Tier V match: The LT vz. 38 should typically be relegated to 2nd or 3rd line duties such as providing supportive fire from medium to long range, intercepting enemy light tanks that breach through the front lines, or if the situation calls for it, some cautious passive spotting. Attacking Tier V heavy tanks (e.g. 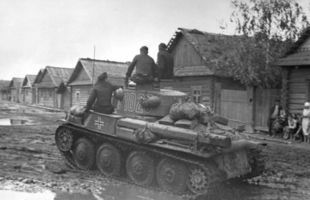 KV-1, Churchill I) or heavy armoured medium tanks (e.g. Matilda, B1) at close range up to 200m should be avoided unless their hp is significantly reduced, and the situation is critical. BIA: Useful for boosting overall crew performance, especially if paired with other crew enhancing units such as Improved Ventilation or meal consumables. Can also be used as a substitute for Improved Ventilation if the objective is to replace it with other equipment of choice. First, research the 37mm Skoda guns (First is a8 model, then a7 model). After that, you need to research the turret for grinding the final gun, which is 37mm Skoda a23 autoloading gun for perfect DPM. 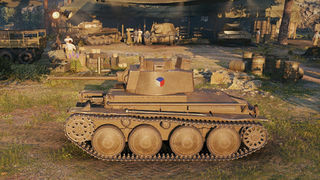 Radio and Engine are options will be choose to research for elite of this tank. The LT vz. 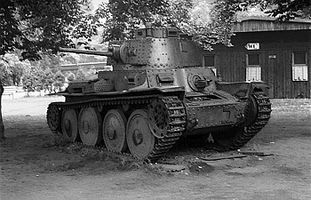 38 (Lehký tank vzor 38, Light Tank model 38) was a Czechoslovak tank of pre-World War II design. Manufacturer's designations included TNH series, TNHPS, LTP and LTH. 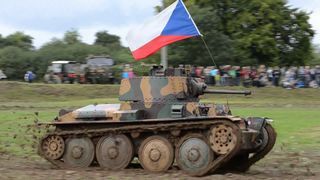 After Czechoslovakia was taken over by Germany, it was adopted by the German Army, seeing service in the invasions of Poland, France, and Russia. 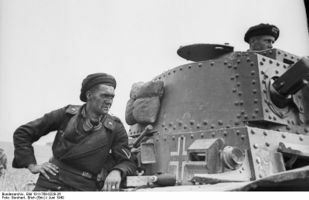 The German designation was Panzerkampfwagen 38(t). The (t) stands for tschechisch, the German word for Czech. Production ended in 1942, when its armament was deemed inadequate. In all, over 1400 were manufactured. 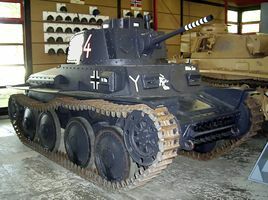 The chassis continued to be produced for the Marder III (1942-1944) with some of its components used in the later Jagdpanzer 38 (1944-1945) tank destroyers, turretless assault guns, anti-tank guns and anti-aircraft guns. 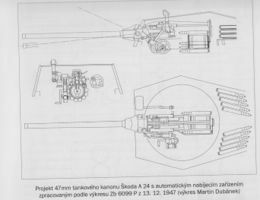 A diagram of the Škoda A24 47mm gun, a 1947 project. 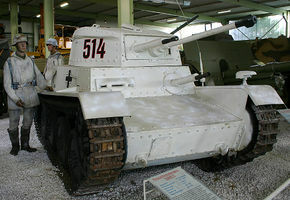 The top 37 mm Škoda A23 is a scaled down version of the gun. This page was last modified on 1 November 2016, at 23:29.